to fancy, here’s a guide to local favorites in the East Village. Start the day with a single origin espresso or exotic tea, along with an order of chorizo egg hash with jalapeno cilantro sauce. Lunch means turkey melts, Mediterranean couscous salads, and Croquet Monsieurs. The airy bright modern space also offers barista classes in coffee brewing, latte art and tea education. For breakfast all-day or a low-fi lunch, retro diner Lucky Lunch Counter is home to a seriously good pastrami sandwich, ballpark hot dogs (nodding to the baseball-themed interior) and build-your-own salads. The Petco Park-adjacent deli and bar, Rare Form, serves up grilled cheese on rustic sourdough, seasonal sausages, and Cuban sandwiches, along with innovative craft cocktails like their herbaceous Basil G&T. After dining, trot upstairs to their gorgeous tropical bar overlooking Petco Park, Fairweather, for a rum grog or planter’s punch. A bustling hub for Padres’ fans that serves food late! Bub’s boasts the best chicken wings in the city – recommended with their Carolina Gold (barbecue with honey) or mango habanero sauces. There’s also corn dogs, sliders, tater tots, indoor basketball hoops, beer galore, game day specials and flat screens at every turn. 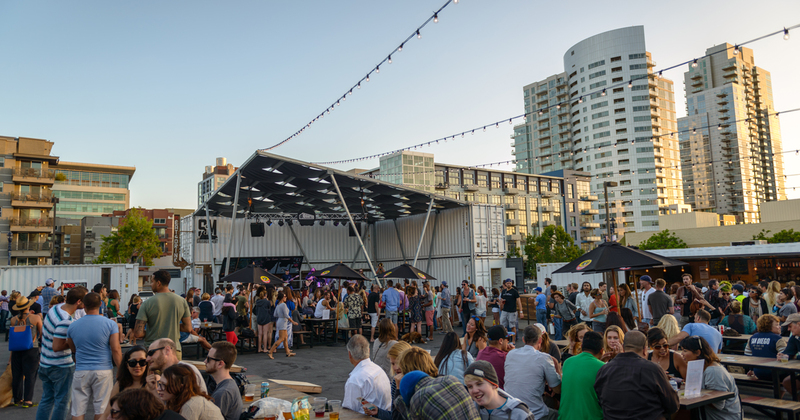 Before heading over to Petco, stop by Quartyard,an Urban Park constructed from repurposed shipping containers, for pre-game eats from food trucks and Sausage & Meat, craft beer, cocktails, and backyard games. The Blind Burro, another high energy, bar-centric spot, spins out Baja-style coastal cuisine, cervezas and fine tequila. Try the salsa flights, rib-eye carne asada tacos, Mexican white shrimp and scallop ceviche, and their sweet potato-chorizo taquitos, paired with a Burro margarita with muddled jalapeno. For traditional Mexican, Salazar’s has been a family owned institution in the East Village since 1972. Think cheap beers, pollo asada burritos and shredded beef tacos. College kids flock to the Hive Sushi Lounge (1409 C St.), a cheap and cheerful haunt open nightly. Another East Village anchor, Basic, is a lively lounge-y warehouse packed with locals enjoying thin-crusted pizzas, craft brews, cocktails, billiards and good music into the wee hours of night. On the outer edge of the East Village, Monkey Paw is a casual brew pub with gold medal beers spilling from the taps and is known for their Philly cheesesteaks, waffle fries and old-school jukebox. Village favorite. Not to mention it shares the space with Halcyon, a hipster coffee spot and bar that serves up breakfast, paninis, and coffee-based cocktails. Stella sports communal tables, wood-fired pizzas, and small plates like lamb meatballs, beet towers and speck-wrapped asparagus. Both spots overlook the greenery and public art of Fault Line Park. A mecca for seafood with a rockin’ raw bar, succulent shellfish platters, fresh line-caught fish and sophisticated wines. Bottega Americano also charms as a vibrant urban food hall with a whirlwind of visuals-chefs throw pizza dough and pull pies from the wood-fired ovens, ribbons of rainbow colored pasta hang on display, oysters beckon from the raw bar, salumi hangs from above, picture perfect pastries tantalize from the bakery, gourmets goods fill the market place, diners share plates at communal tables and mixologists sling scintillating sippers behind the bar. Floor-to-ceiling, black-and-white images fill the walls with 1950s glam shots from Italy. It’s a scene with gorgeous décor and truly reflects the best of the best in the East Village. This entry was posted in Culinary and tagged dining/libations, downtown by Ann Wycoff. Bookmark the permalink.